First week back at uni has been okay. I got back on Saturday 10th January with the hope of getting some work polished off early before most people got back on the Sunday. That didn't happen. It took ages to unpack and then once I did that I just wanted to chat to two mates from our flat that I'm very close to. Then on Sunday everyone else arrived and it was a lot of fun to have our tight knit friendship group back together again. Unfortunately, my term started on the 12th; the draining monotony of 9am starts 5 days a week had begun again. I wouldn't have minded this, however all my flat mates who aren't studying medicine either have no lectures throughout January or just one or two here or there. The week started off well with getting really good assessment in my Communication for Clinical Practice session, which I was really happy about. Discussing the best ways to communicate with a patient really interests me, as the social and practical side of medicine is what really drew me towards this vocation. I then had my anatomy session on Tuesday and that was fantastic, too. I enjoyed learning about how the heart changes through embryology to an adult heart, but learning the different latin names is less fun! I'll probably keep forgetting that the foramen ovale changes to then become the fossa ovalis. I was really happy to get 100% in the test at the end. Things were looking up for this week. Unfortunately, I then started to get these migraines. Normally I scoff at anyone who says they have a 'migraine' rather than just a bog-standard headache; I just assume they're trying to make their problem sound worse than it is so you feel bad for them. 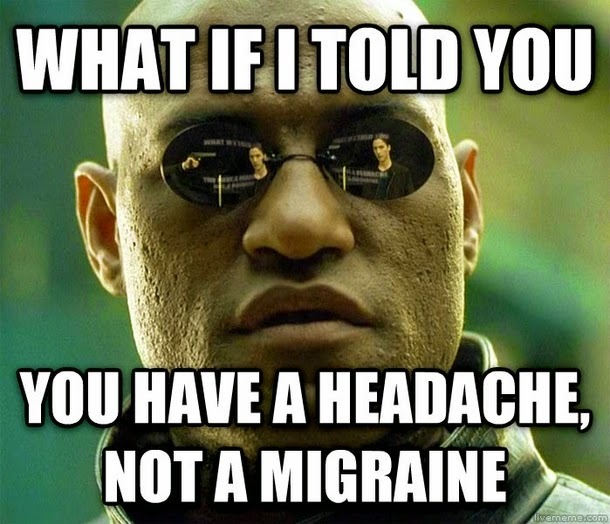 Headaches are routine and you don't necessarily sympathise that much, but an enigmatic migraine? That sounds worse, doesn't it. I've only just realised it probably is a migraine when one of my medic friends said my symptoms matched. I've been very stressed out with work, and then started getting splitting, throbbing headaches that wouldn't go away with Paracetamol or Ibuprofen. Then I started getting a lot of light sensitivity and couldn't look at laptop or TV screens and would just sit in my room with the lights off. After that I became nauseas and have been repeatedly sick whenever I try to eat. I feel sick all the time and have a dull stomach ache. I then went on the NHS website and looked for migraine, and the common symptoms seemed to correlate. Joy of joys. Consequently, I've had three days off uni and feel really guilty about it, particularly when I have so much work to get done. This weekend will be spent in the library catching up on missed lectures and completing my case-based studies. Annoyingly I have to complete a study on a part of our cardiovascular block that I won't be lectured on until the morning I am meant to present my study! Enough ranting. Hope you've had a good week. January is often the start of medical interviews, and to anyone who's got one, I wish you the best of luck! Unfortunately I'm not going to carry on the blog award challenge simply because I don't read enough blogs on a regular basis to nominate 15 bloggers.